The New York Jets had a 10-4 record and were looking to wrap up the AFC East title as they faced the Buffalo Bills on December 19, 1998. In their second season under Head Coach Bill Parcells, the Jets were a far cry from the 1-15 club of two years earlier. Newcomers to the offense, most notably QB Vinny Testaverde (pictured at right) and RB Curtis Martin, were having a major impact, as were wide receivers Keyshawn Johnson, a flashy third-year player, and Wayne Chrebet, a classic overachiever in his fourth season. The defense was strongest at linebacker, where Mo Lewis was joined by Bryan Cox, let go by the Bears but revitalized with the Jets. Buffalo was coached by Wade Phillips and came into the contest at 9-5. Diminutive 36-year-old QB Doug Flutie had turned the club around in his return to the NFL from the CFL, taking over for QB Rob Johnson after a slow start. Retooling from the squad that had started the decade with four straight AFC Championships, the offense now also featured RB Antowain Smith and WR Eric Moulds while RB Thurman Thomas and WR Andre Reed had reduced roles. The tough defense was still anchored by DE Bruce Smith, who was beginning to slow down at age 36, as well as NT Ted Washington. There were 79,056 fans in attendance at Rich Stadium on a windy Saturday. The Bills had the first possession and advanced into New York territory thanks to a pass from Doug Flutie to Eric Moulds that picked up 28 yards. Another throw to WR Quinn Early gained eight more yards to the 23, but on the next play the usually sure-handed Antowain Smith fumbled and LB Pepper Johnson recovered for the Jets. New York drove 79 yards in eight plays. Vinny Testaverde threw to Keyshawn Johnson (pictured below) for 16 yards on first down and, after the series appeared to be stymied at the Jets’ 37, Testaverde ran for 14 yards on a third-and-10 play. Two plays later, RB Dave Meggett, who had only recently joined the team, gained 18 yards on a carry up the middle, Johnson picked up another 25 yards on an end-around, and it was Testaverde to Wayne Chrebet for a seven-yard touchdown. John Hall added the extra point and the visitors had the early 7-0 lead. On the next possession, the Bills converted a third-and-nine situation with a Flutie pass to Moulds for 27 yards, but a 15-yard taunting penalty on the receiver at the end of the play erased most of the gain and Buffalo was ultimately forced to punt. Chris Mohr’s kick traveled 47 yards and pinned the Jets back at their one yard line, and a short series resulted in a punt in return. A 30-yard kick by John Kidd went just 30 yards and gave the Bills good starting field position at the New York 40. But after a short Flutie pass to Smith gained five yards, two more throws were incomplete and, facing fourth-and-five, another pass intended for Moulds also was unsuccessful. The teams continued to exchange punts as the game entered the second quarter. Finally, Buffalo put together an 11-play drive that covered 79 yards. Flutie completed passes to FB Sam Gash for nine yards and WR Kevin Williams for 22 yards in a third-and-six situation. Smith ran effectively and Flutie himself had a nine-yard run. 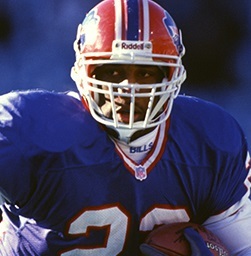 Flutie connected with Thurman Thomas for a 25-yard TD to complete the series and Steve Christie added the point after to tie the score. Following a punt by the Jets, the Bills drove from their one to the New York 10 as Flutie completed three passes, the longest to Moulds (pictured below) for 35 yards, but they ultimately came up empty when Christie was wide to the left on a 28-yard field goal attempt in the final seconds of the half. The score remained unchanged at 7-7 although Buffalo had already accumulated 266 yards. The Jets started off the third quarter by advancing into Buffalo territory. Testaverde completed consecutive passes to Keyshawn Johnson for 16 and six yards and Curtis Martin had a nine-yard run. Hall kicked a 48-yard field goal to put the visitors back in the lead by 10-7. Buffalo responded with a long scoring drive. Smith carried most of the load, picking up 35 yards on eight attempts and Flutie converted two third downs, one on a pass to Williams for seven yards and another on a three-yard run. The advance finally faltered at the New York 26 and Christie tied the score once more with a 44-yard field goal into the wind. But two plays after the ensuing kickoff, Testaverde threw to WR Dedric Ward, who beat CB Donovan Greer, an injury replacement, for a 71-yard touchdown. Hall’s kick gave the visitors a seven-point lead. The Bills had to punt following the next series and the Jets moved into Buffalo territory, helped by a defensive holding penalty in a third-and-nine situation. But they were again forced to try for a field goal and Hall’s attempt from 46 yards was no good. Following another exchange of punts, the Bills had good starting field position at the New York 49. Keeping the ball on the ground, they reached the 21, but a Flutie pass was bobbled by Williams and barely picked off by diving CB Victor Green (television replays were inconclusive as to whether he maintained possession) with just under four minutes remaining in regulation. The Jets went three-and-out, with Kidd’s punt sailing 57 yards. Starting from their 20, the Bills had one last chance and Flutie immediately threw to Moulds for 17 yards. But following a short run by Thomas, the next three passes fell incomplete to turn the ball over to New York on downs. There was still 1:32 left on the clock, but a Testaverde throw to Johnson for seven yards on a third-and-six play nailed down the 17-10 win for the Jets. Buffalo had the edge in total yards (366 to 269), although the Bills gained only 100 yards in the second half. They also had more first downs (21 to 14) and ran far more plays (74 to 51). However, the home team also turned the ball over twice, to none suffered by the Jets. 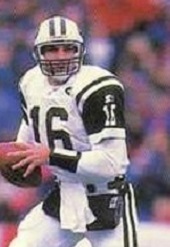 Vinny Testaverde completed 14 of 23 passes for 184 yards and a touchdown while giving up no interceptions. Keyshawn Johnson had 7 catches for 66 yards while Dedric Ward gained a team-leading 71 yards on his one long scoring reception. Curtis Martin was held to 38 rushing yards on 20 attempts. For the Bills, Doug Flutie had a rough outing, completing just 14 of 38 throws for 220 yards and a TD as well as an interception. While he was only sacked once, he faced heavy pressure and was knocked down often. Antowain Smith (pictured below) gained 82 yards while running the ball 20 times. Eric Moulds topped the receivers with four catches for 107 yards. The Jets won the season finale to finish at 12-4 with their first division title since they were an AFL team in 1969. They reached the AFC Championship game before losing to Denver. Buffalo ended up in third place in the AFC East with a 10-6 record and qualified for the playoffs as a Wild Card. The Bills lost to Miami, the club that finished second in the division, in the first round. Vinny Testaverde ended up with an AFC-leading 101.6 passer rating, throwing for 3256 yards and 29 TDs with just seven interceptions. He was selected to the Pro Bowl along with Keyshawn Johnson, who caught 83 passes for 1131 yards and 10 touchdowns, and Curtis Martin, who had many more productive games on his way to 1287 rushing yards. Doug Flutie also was chosen for the Pro Bowl as he started ten games, seven of them wins, and threw for 2711 yards and 20 touchdowns against 11 interceptions. 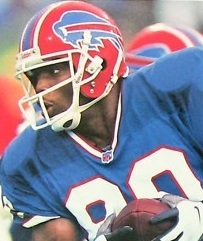 Eric Moulds led the AFC with 1368 pass receiving yards on his 67 catches with 9 TDs and was another Pro Bowl selection. Antowain Smith, in his second season, rushed for 1124 yards while averaging 3.7 yards per attempt and scored eight TDs.